The New York Giants are in need of offensive line support to complement Eli Manning and their star-studded wide receiver Odell Beckham Jr. The question is: Who best fits their needs, and who can be an answer on the line for years to come? With names like Mike McGlinchey, Orlando Brown, and Isaiah Wynn looming in the draft, the Giants have a collection of directions they could go with their No. 2 overall pick. 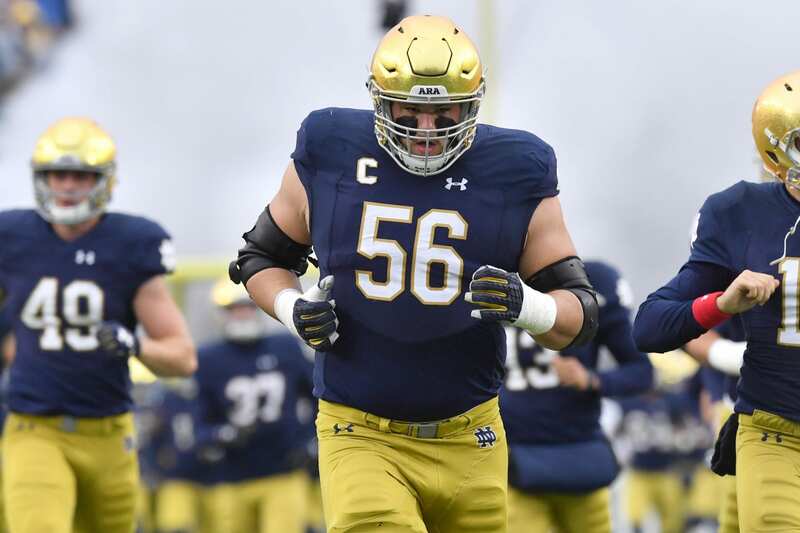 If they choose to address the offensive line in the first-round, they shouldn’t look further than Notre Dame’s Quenton Nelson. Standing at 6-foot-5 and weighing in at 329-pounds is the top-flight guard. He’s built like a bull, with a broad chest and power beyond belief. He’s rarely beaten alone on bull-rushes or one-on-one match-ups against defensive tackles. His aggressiveness is unparalleled, forcing defenders back and often taking up two pass rushers at once. Alongside teammate Mike McGlinchey, they provide fearsome double-teams. Imagine what a line with Nelson and Andrew Norwell could accomplish. It would provide Eli Manning with ample time to throw the ball, and a stud running back to walk all over opposing teams. Watch as No. 56 comes flying across the screen towards the right to plant an incoming defender into the ground. He simply lowers his shoulder will minimal power and send him pile-driving into the ground. The most enticing aspect of Nelson is his agility and speed at his current size. His lateral movement is pure, which is why he’s able to shift to the opposite side of the line very quickly. His agility contributes towards his immense ability to run-block and stuff defenders at the point of attack. The strength he posses in his legs allows him to move through blocks easily; finding his way to the next level and opening up holes for running backs. In this scenario, the Giants would likely trade back in order to stockpile picks and still grab the best lineman in the draft. If Dave Gettleman decides to take this course of action, the Giants could have one of the most daunting offensive and defensive lines in the game.